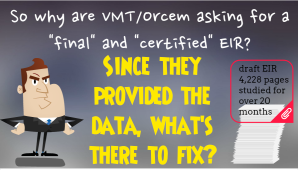 Why is VMT/Orcem asking for a “final” and “certified” EIR? It’s a legal trick! Our Mayor and City Council must uphold the Planning Commission decision now! Later, if “certified” the City is more likely to be sued!